I read this article and found it very interesting, thought it might be something for you. The article is called Restaurant Reviews: Camden Kitchen and is located at https://www.totallydublin.ie/food-drink/restaurants/camden-kitchen/. Even in a city of modest size, there is always activity bubbling under the surface that goes unnoticed. Whether it’s a Wildean Salon in a house on Merrion Square or a BYOB gig happening in a gallery, those who invest time seeking out-of-the-ordinary events are, more often than not, rewarded for their curiosity. I’ve been having quite the autumn of rediscovery in Dublin and my meal in The Camden Kitchen accentuated that. It’s a place that has been circling around my food radar since its opening in 2010 and I was conscious of murmurs of the treats that lay behind its doors. Yet, as the initial very subtle hype simmered down, it kept being bumped from the top of my to-try list by places that were shouting louder. It seems that head chef and proprietor Padraic Hayden is happier to just get on with things. There’s nothing about him or the cooks on the restaurant’s website, which prefers to highlight the space and its food. And, so, it was a somewhat stunned sense of delight that accompanied our three course meal there recently. It was already full on the first floor when we arrived at 7pm and were shown, smilingly, to our seats. We were menued and Kir Royaled within minutes, giving us time to relax and peruse the menu. 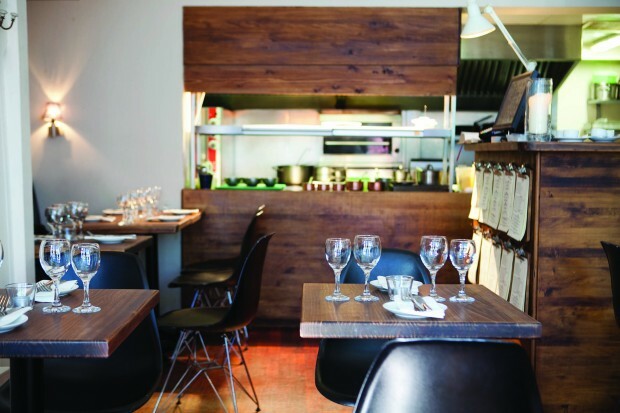 We were seated very close to the open kitchen, which meant we had a lively view of its mechanics throughout the meal. This is a calm kitchen with a clear leader. There’s no shouting or banging, and, though it’s a relatively small space, the kitchen team seemed never to bump into each other. I loved soaking in its atmosphere, despite the ßside affect of raising the temperature of the restaurant to just-about tolerable levels. The heat was, however quietly, on. The usual favourites are on the menu – ham hock terrine and free range Coq au Vin – but it’s written in a way that entices, with extra flourishes that make you want to order it all. I couldn’t let the special of wild Wicklow wood pigeon with paté on toast pass me by. At €12.50, it was a good deal more expensive than the regular starters but, boy, was it worth it. Rich, dark, deep, satisfying meat with an insanely good layer of paté just in case you didn’t feel spoiled enough. Niall started with the less in-your-face goats cheese croquettes (€8.50), whose black olive, green bean and tomato confit added another level to these crispy mouthfuls of loveliness. The homemade butternut squash ravioli with mushroom purée, Cashel Blue, baby spinach and pumpkin seeds was winking at me from the menu. The Maurice Kettyle aged rib eye steak with truffle celeriac purée, dauphinoise, bone marrow with gremolata seductively whispered ‘Pick me. Pick me!’ Finally, upon recommendation by our waiter, I chose the smoked haddock risotto (€17.50). This arrived topped with poached eggs, summer greens and the most marvellous little flakes of shaved bonita. It’s a very salty dried fish and when the super thin shavings hit something hot, they dance around. I sat staring at my dish mesmerised before tucking in to its deep, awesome flavours. Nothing gimmicky about this dancing dish. 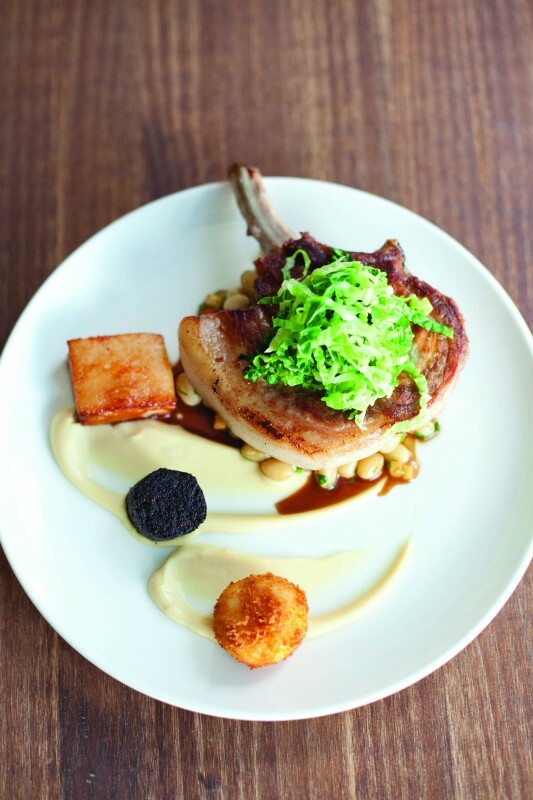 Niall couldn’t resist the superb special of rare breed pork chop (€24) with crunchy cabbage, black pudding and homemade spatzle, the German-style pasta. “Where is the pig from?” I asked the waiter. “But what farm is the pig from?” I probed further. I was kidding and the waiter took my annoying-customer-who-thinks-they’re-hilarious shtick with excellent grace. The desserts, both priced at €7.50, topped off an already brilliant meal. Niall’s raspberry mousse with sorbet and Sablé Breton crumbs was exuberantly sweet while my delicate lemon & poppyseed madeleines packed a quirky punch with a side of basil sorbet. Our entire bill, including three glasses of wine, came to €97.50. I noticed our Kir Royales were missing from the receipt. I flagged it with our waiter who rewarded my honesty by keeping them omitted. Nice touch. Sure, we paid a considerable price for all this unassuming wonderment but it’s a price I’d happily pay again. And, hopefully, I’ll be lucky and I’ll find myself back in The Camden Kitchen again soon.